Throughout her career, New York-based Angel Chang had worked with internationally acclaimed designers such as Chloé, of See By Chloé, and Donna Karan, and has written for publications from V Magazine to French Vogue. In 2006, she launched her own line of high-tech clothing, working with engineers to create innovative clothes, like a self-heating jacket. With all of her professional accomplishments, including a graduate degree from Columbia University, Chang's fashion career appeared to be on track. But in 2008, the Great Recession changed everything for Chang, who realized she needed to return to something more meaningful. After discovering the intricate fabrics of the Miao and Dong ethnic minority groups of China in a museum exhibition, Chang became fascinated by the craftsmanship that utilized no electricity, and was completely hand-embroidered from local materials. “We must think more creatively about what we design." "The only power source required produce our fabrics was sun and skillful human hands," Chang told NBC News, "and I quickly understood that this was how clothing was made throughout human history." Coming from a culture of mass consumption that was facing recession, Chang said she found the indigenous people’s production process and way of life eye-opening. Here were remote mountain tribes living with the cycles of nature, leaving a low carbon footprint, and eating in-season, locally harvested foods. Chang realized that there was a lot of to learn about how to live a more sustainable lifestyle that respects the earth. "It made me realize that somehow, in the last 150 years, we in the Western world have become so dependent on electricity that we have forgotten how to live with it," Chang said. In 2012, Chang moved to the Guizhou province in southwestern China, where she lived and learned from the agrarian lifestyle of the Miao people. While there, she moved from high-tech clothing production to learning how to create the lowest tech, "farm to fabric," clothing. When Chang arrived, she said she discovered that the Miao people created out of sheer necessity. “What people saw as poverty, I saw as beauty. People were making beautiful items that lasted forever,” she said. But Chang also discovered that the younger generation of Miao ethnic minority people were hesitant to continue the labor-intensive craft that used intricately designed, hand-woven, and naturally dyed fabrics, particularly as the world became more modernized. Afraid that the centuries-old craft would disappear in a matter of a years, Chang began to show the younger women how their grandmother's fabrics could be updated by applying them to modern fashion silhouettes to bring a fresh look to the materials. This inspired Chang to create a modern collection using traditional Chinese fabrics in order to re-introduce the materials in a new context. “Rather than watch an ancient culture disappear from the sidelines, I wanted to find a way to continue the craft,” Chang writes on her website. "Rather than watch an ancient culture disappear from the sidelines, I wanted to find a way to continue the craft." 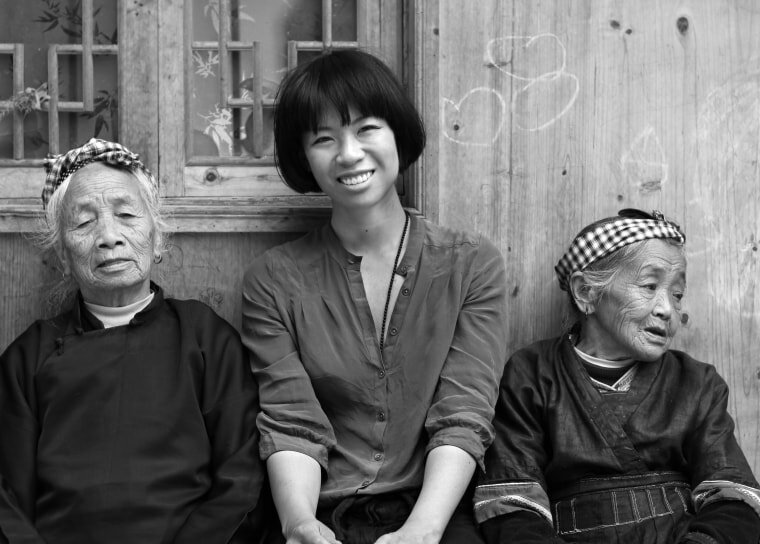 Along with her efforts to help preserve the traditions of the Miao and Dong people, Chang is using her work as a call to action too. With the knowledge that the global textile industry is ranked the second biggest polluter in the world because of the dyeing, rinsing, and chemicals that are involved in the production process, Chang aims to design clothes that are in "harmony" with the environment. “As 90 percent of a product’s environmental impact is determined at the design stage, it is clear that we must think more creatively about what we design," Chang writes on her website. By following traditional methods to create her collection, Chang worked with the Miao and Dong people to grow their own cotton, spin their own thread, and wait for certain flowers to bloom to create dyes for fabrics. Chang’s investment in the craft, as well as in the Miao people, has not gone unnoticed. This year, she was selected as a finalist for the multimedia competition at the Alliance for Artisan Enterprise, an initiative founded by former Secretary of State Hilary Clinton in 2012 to promote artisan enterprises around the world. Chang also had the opportunity to present her work to Secretary of State John Kerry, who then included her work in a speech he delivered at the Artisan Enterprise event hosted by the U.S. Department of State in Washington D.C. Recently, Chang partnered with the Global Heritage Fund and the Dimen Dong Eco-Museum to find ways to help preserve the cultural heritage and environmental conservation of the Guizhou Province. The partnership will help to organize local villagers into farmer co-ops to help reproduce their fabrics and crafts to be made available to the outside market, while supporting their livelihoods. “It has taken many years, but the [local villagers] now understand my desire to work with their traditional fabrics," Chang said. "Somehow fashion is a universal language that speaks across cultures, and everyone seems to understand the quest for beauty."